My Card Attic: Two Birds . . . One Card. Today's card was made with two challenges in mind. The CAS.ology Week 129 - NBUS Challenge which calls for 'something new to you, and the Craft Stamper - Take It Make It January Challenge - 'Take A Stamp', which calls for us to make a card that has to incorporate the use of a stamp or stamps. The stamp I used was one that I bought a while back but never got round to using, hence the NBUS - Darnell's acronym for Never Before Used Schtuff - so it was the ideal thing to use for both of the challenges and here is the card. The stamp I used was My Favorite Things 'Spotlight Sentiments' and the inspiration was a card I saw a while back, that I think was made by one of the MFT team, sorry, but I forget where and who, but if I find it again, I will link to it. My Favorite Things, 'Spotlight Sentiments' stamps and My Favorite Things, 'Blueprints 18' dies set. American Crafts, Textured cardstock and Wink Of Stella, Clear. This is so striking. Love how you repeated that sentiment and highlighted just the one. Perfect stamping, too. Great use of angles as well. Thanks so much for playing along at CASology this week. This is an amazing masculine card~ That layout rocks!! Love the angle & CAS design! Thanks for stopping by & seeing my challenge cards too! Happy Friday! Gorgeous example of CAS! Thanks for joining us at the CS Take It Make It Challenge. Wishing you the best. Hazel, you have done a fantastic job with this layout! I love the way you have drawn the happy birthday out with the color. The bling adds such a celebration feeling. It is a winner in my eyes!! 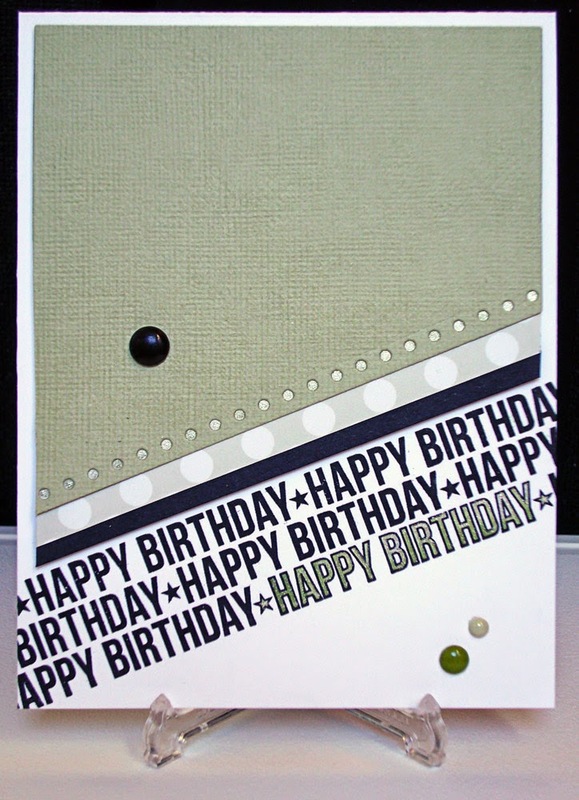 I love this card and how you used the sentiment combining perfectly with the soft green!! Hugs!!! Wonderful stamping! I love the silver highlight on the sentiment. Hazel, this is one festive birthday card...I love how you repeated the sentiment, looks fabulous and so perfect for anyone too. Subtle, yet dynamic! Nuff said! Gorgeous! I love all the interest you've added to the angled panels. What a fabulous card! Your stamping is perfect as is your choice of adding the little bit of sparkle! 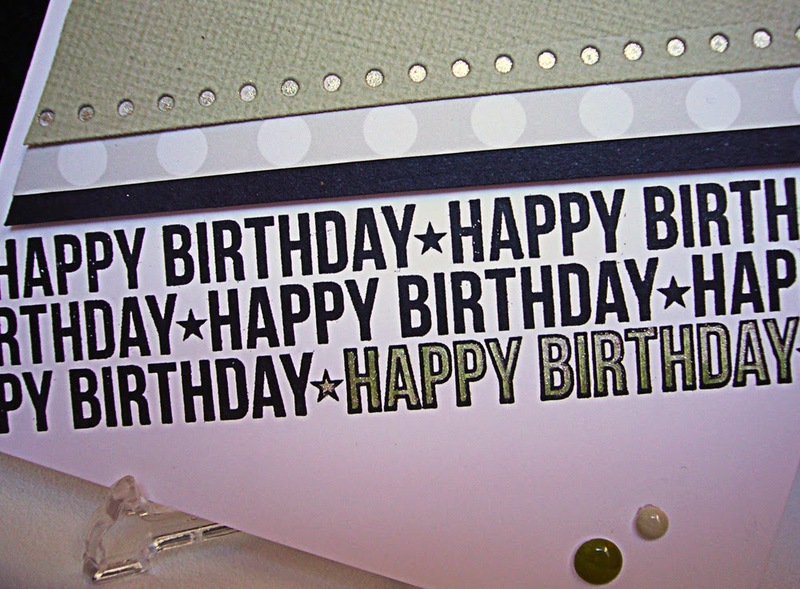 Wonderful card and perfect masculine design!! Love the glittery gold wording!! :) Happy weekend! 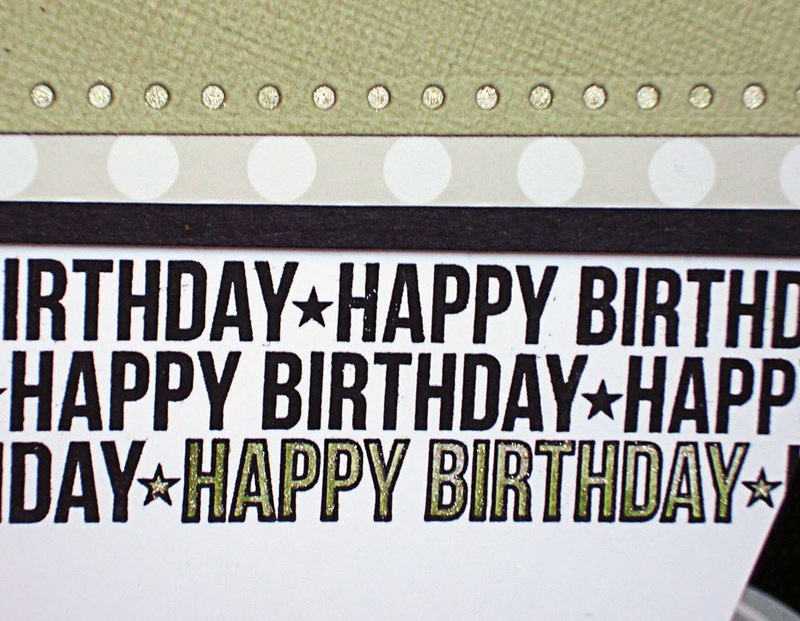 A very elegant and simply beautiful card, Hazel! I love it! Great design! Love the sparkle! Hey Hazel!! I love your birthday card. I love how you repeated the sentiment at the bottom of the card, leaving the top of your card with plenty of "white" space. Nicely done. Thanks for playing along with us this week at CASology.